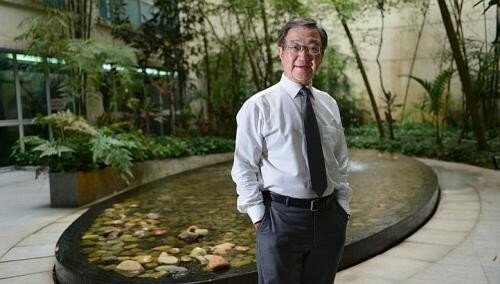 After more than three decades of running his own firm, Raffles Medical Group executive chairman Loo Choon Yong still considers himself a doctor first. The 64-year-old still tends to patients even as he oversees the running of one of the largest health-care firms in Asia. They are mostly patients who have consulted him over the decades, since he started out as a general practitioner. While medicine remains his first love, Dr Loo has proved himself adept at business too. He was named Businessman of the Year at the annual Singapore Business Awards yesterday. Speaking yesterday at a press conference to announce the award winners, Dr Loo said Raffles Medical's focus on putting patients first is the main reason for its financial success. "The most important thing is how to stay true to looking after our patients properly," he said. "Many of my team members, my management staff, doctors and our nurses and support staff have worked hard and done well and helped build an organisation, and this is a recognition of all their efforts." Dr Loo founded Raffles Medical in 1976 with his classmate and partner Alfred Loh. What began as just two clinics in the Central Business District has since grown into one of the biggest and most profitable health-care firms in Asia, with 76 multi-disciplinary clinics in Singapore and four medical centres in Hong Kong and Shanghai. The firm announced in February that net profit for the full year rose 13 per cent to $57.2 million. It was listed on the Singapore Stock Exchange in 1997, and now has a market value of $1.8 billion. The Singapore Business Awards, organised by The Business Times and DHL Express Singapore, named NTUC Income head Tan Suee Chieh Outstanding Chief Executive of the Year. In the past three years, Mr Tan has been leading NTUC Income's drive to be the most ethical insurer in the industry. "We realised that being cheap and good is not good enough, because the world and Singapore have changed, people have changed... So we came up with the notion of honest insurance - how about us being the most ethical insurer in the industry and potentially beyond Singapore?" To achieve this goal, NTUC Income strives to be fair to customers, paying out claims according to the intention of their insurance plans, not merely their legal obligations. It also uses plain English in its contracts so that customers always know what they are buying into. His efforts have not gone unnoticed. Three or four years ago, he said, NTUC Income received more customer complaints than compliments. Today, however, the firm receives three customer compliments for every complaint. Ogilvy & Mather New York's worldwide chief creative officer, Mr Tham Khai Meng, was named Outstanding Chief/Senior Executive (Overseas) of the Year, while Super Group received the Enterprise Award. In their citation, the judges said Super Group received this award for its innovation, having built itself from scratch into a household name, with its products sold in more than 50 countries worldwide. "Food innovation is very important to the company," said chairman David Teo. "We always strive to make ourselves different from our competitors. For example, we recently went to Ipoh to learn about their white coffee and replicated it in instant form."